Here's a quick recap of today's second weekly tea class. (Sorry for the poor quality pix, due to poor lighting conditions). 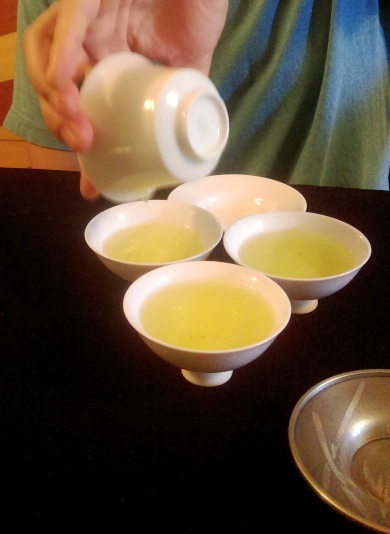 - Green tea: After withering and before any oxidation occurs, the tea is subjected to a high temperature. In China, this usually occurs in a pan, in Taiwan in an oven and in Japan over steam. 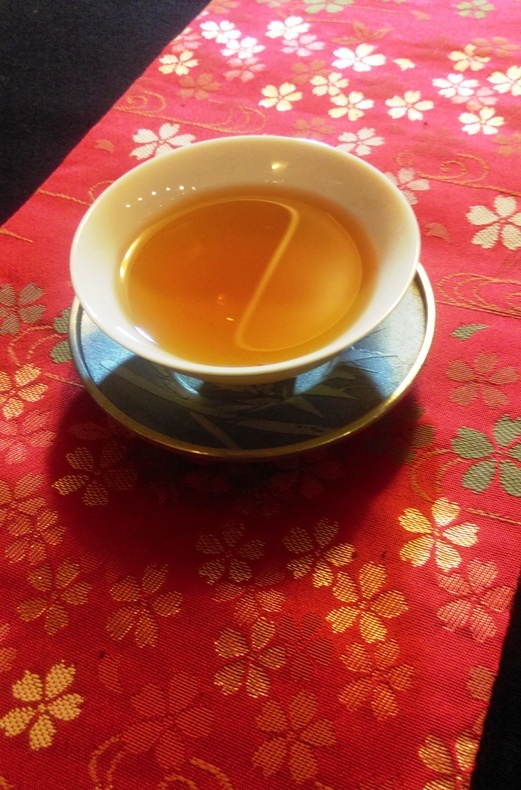 - Red tea: the leaves are fully oxidized. - Black tea: the leaves are fermented. This obviously includes shu puerh and similarly fermented teas from nearby regions. 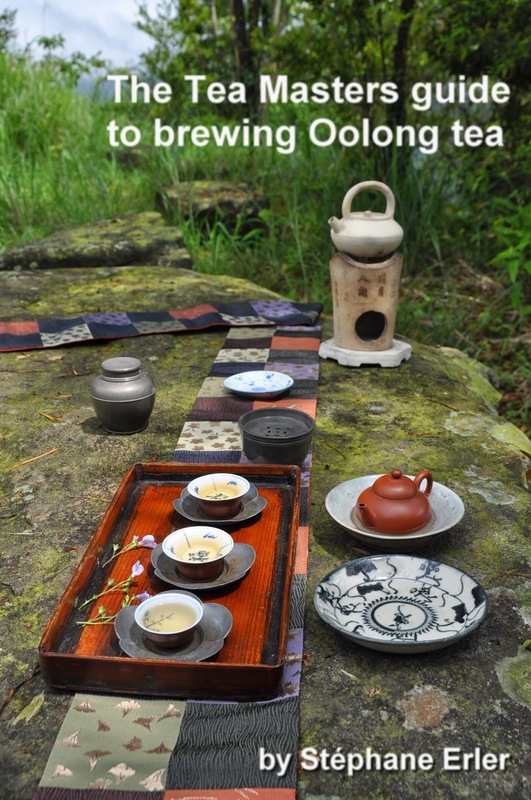 This category also includes raw puerh, because this tea will naturally ferment as it ages. 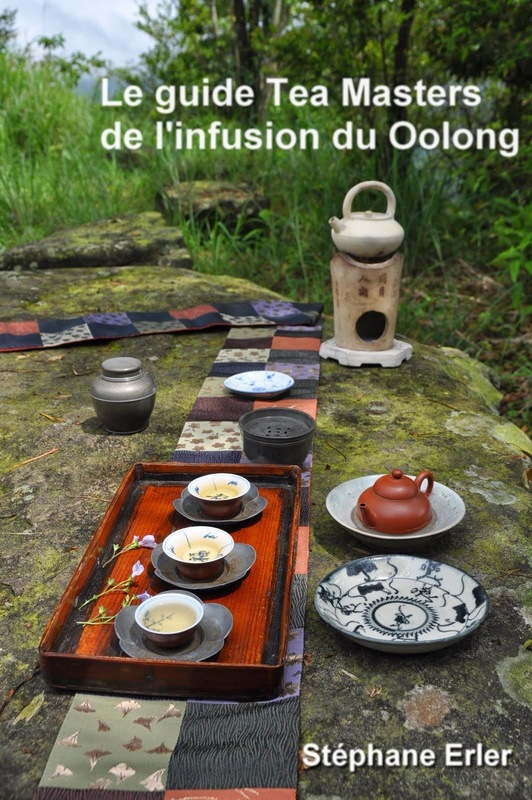 To better understand the importance of the process, we brewed 3 teas from the same cultivar, Qingxin Dapang, but made with very different oxidation level. 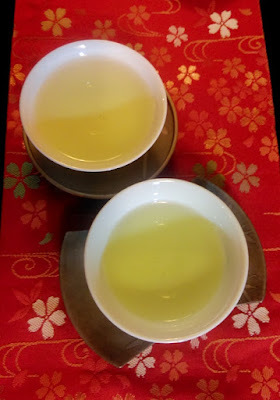 Above, left, is the Qingxin Dapang Wenshan Baozhong and on the right is the green tea. Both from this spring. The brewing method is quite different for these 2 teas. What surprised the students most was that we used off the boil water for green tea also and that it tasted so good (provided the water is poured gently)! The color of the brew is also impacted by the color of the porcelain. We can see that the same green tea looks yellow or green depending in which cup it is poured. The leaves for the green tea are harvested smaller than for Baozhong. 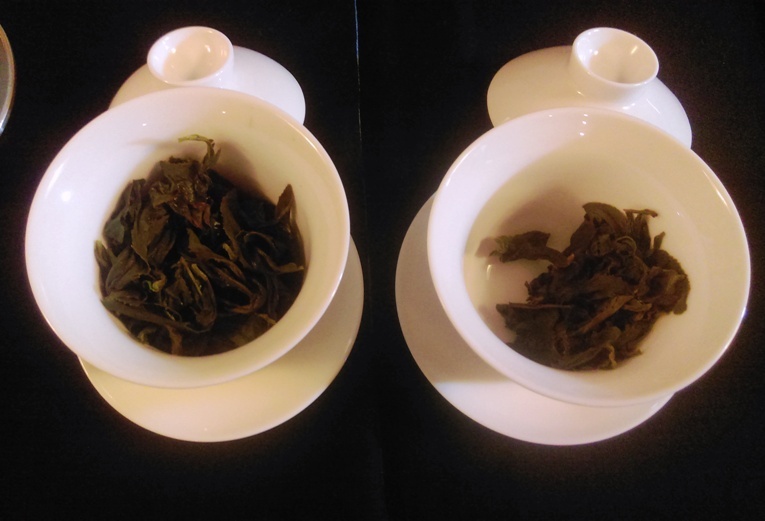 And despite this Baozhong being only very lightly oxidized (the leaves looked still very green), the difference in character between these 2 teas was huge. This shows that the cultivar is indeed less important than the process in classifying a tea. It's within the same category that it makes sense again to look at differences in cultivar. Giovanni switched from a medium sized handmade gaiwan to my smaller ivory gaiwan and found it easier to hold and handle. Practice also helps. This comparison also showed that each cultivar has a category that suits him best. And while the green tea and Baozhong were very pleasant, it's the highly oxidized traditional Oriental Beauty made with Qingxin Dapang as well that impressed most. This was especially the case for the prolonged first brew. It had so much complexity, flavors and aftertaste... and didn't taste bitter. But beyond enjoying great teas, what mattered most was to experience the variation of taste due to the process and the brewing. 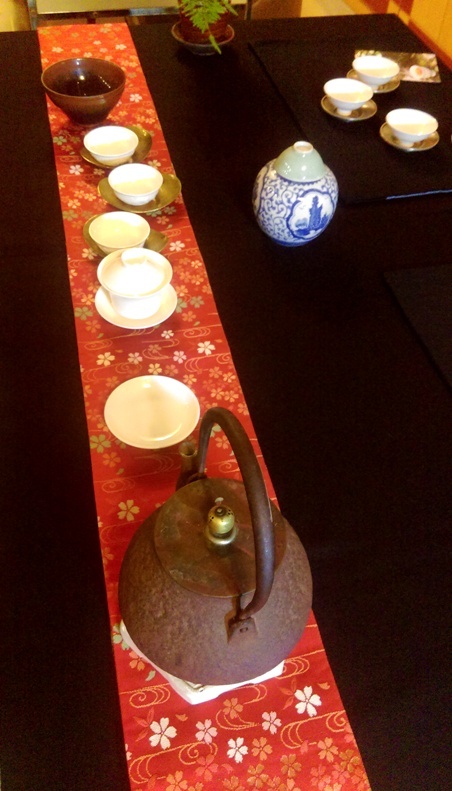 For a same tea, we used the same amount of leaves, the same gaiwan, the same water... 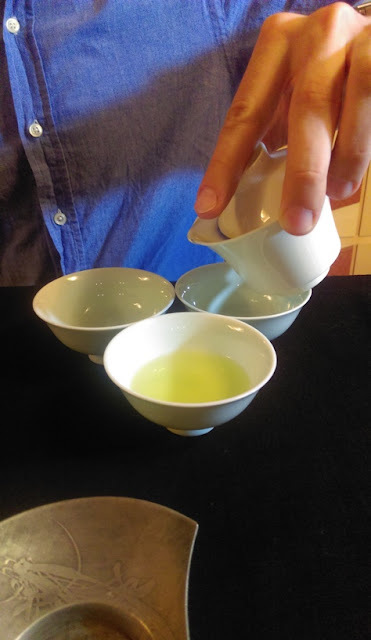 The only difference was how the water was poured in the gaiwan and how long. Becoming aware of how much tea can change and taste differently due to this is the first step to understand the importance of the brewing process and to start paying more attention to it. To a very successful next class! (To be announced on the TeaMastersBlog Facebook page). Thanks. In addition to the handsome set-ups that's an excellent post. What I liked is your comment that the country and cultivar are secondary to the tea making process.